Everyone deserves a little holiday cheer this season and Kaboodles Toy Stores are doing so with a charitable toy drive. On now until Christmas Eve, you can visit any of Kaboodles’ four locations to participate in this fun and meaningful toy drive. All donated gifts will be delivered to the Lower Mainland Christmas Bureau to help families in need provide gifts to their children this Christmas. The Lower Mainland Christmas Bureau has been dedicated to making Christmas a little more special for struggling families since 1930. Visit Kaboodles in Point Grey, Cambie, Granville Island, or in Victoria to help them collect hundreds of gifts for struggling families this year. With your purchase in-store for a toy drive gift, you’ll receive a 10% discount. Kaboodles will be offering special incentives and giveaways to those who participate in the Toy Drive each week. 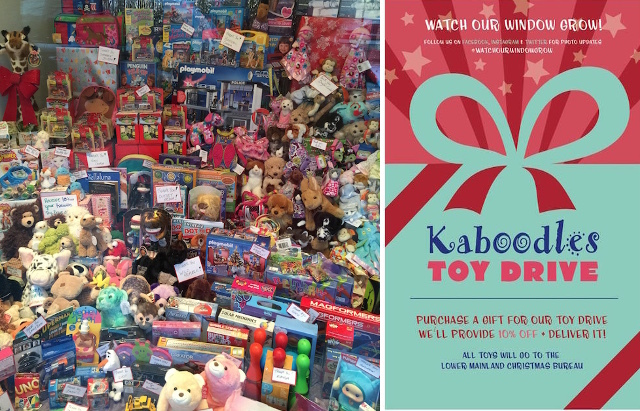 Follow the action (and watch the pile of donated toys grow each day) by visiting Kaboodles on Facebook, Instagram and Twitter (#KaboodlesToyDrive). Another BIG incentive to support the Kaboodles Toy Drive is a Playmobil Giveaway for Miss604 readers. Enter to win $200 to spend on Playmobil at any Kaboodles! I will draw one winner at random from all entries at 12:00pm on Tuesday, December 16, 2014. Follow Kaboodles on Facebook, Instagram and Twitter for more details, deals, and news. Update The winner is Meredith! My FAVORITE set can be bought there! The Playmobil Stable! My son really wants the pirate ship set and a deserted island! My son loves the construction sets! My niece is obsessed with these! She’s got here eye on Dragon Island. Action City is the best! The pirate ship – it’s on my son’s wishlist! dragons – verywhere on dragon island! African wildlife is so very cool! They alll are! Dinos! My nephew would love this one! You can find dragon island! RAWR! I like the African Wildlife. The Animal Clinic would be perfect for my friend’s daughter. I know someone who would love the Construction set! Fire rescue! My sons would love them all! The zoo!! Thanks for the giveaway! Dragon Island would be great for my nephew! My son would love the Fire Rescue set!